From George Blood - Are your audiovisual archival records safe? In many ways, in most ways, AV artifacts are like any others you’ll encounter in libraries, archives, and museums. All the basics of care and handling apply – lower temperature, lower humidity, lower UV, lower dust, proper containers, gentle handling. Though the specifics may vary, the big picture does not. Looking back on the history of what is now George Blood Audio/Video/Film/Data, our first identity in the archives community, Safe Sound Archive, is in climate controlled storage. 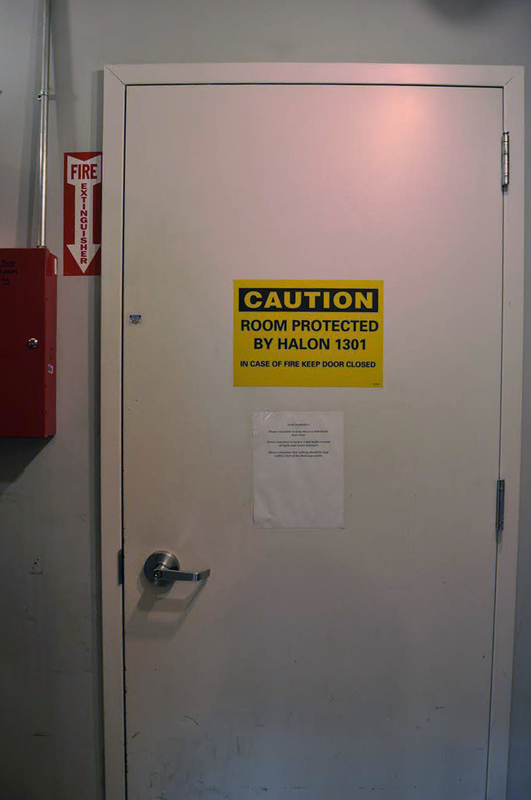 We remain the only digitization vendor with a climate-controlled vault, a fire-proof vault, complete with a grandfathered Halon system. Here the temperature is monitored by IPI PEMs confirming 65 deg F, RH below 35, UV filters on the lights, routine cleaning, baked enamel finishes on the manual high density shelving. Safety of our audiovisual heritage requires many other things. Shipping entails proper packing, accurate logging of shipments, systems to be sure addresses are current even when they change over time, prompt notification of boxes received and sent. "We have adopted the recommendations of the Image Permanence Institute to allow a wider range of fluctuation. They have shown it does not harm media, and by turning the system off over night when no one is using the storage, we reduce our carbon footprint." Sarah Mainville our registrar, brings her MLIS to the care of every object. Logging and tracking the coming and going of each object at the item level, she keeps track of the whereabouts and condition from the time media arrives until it heads home. She’s not only responsible for and to all media, she’s empowered to purchase supplies and equipment, hold staff accountable for returning boxes to their designated location in the vault. Sarah is also keeper of our disaster plan, including the CoSA-inspired pocket plans carried by all staff. We routinely share our plan with institutions that need recommendations on how to plan for recovery of audiovisual media. Safety of artifacts means more than following best practices of storage and handling, training and tracking, more than millions of dollars in insurance – whatever form it takes from liability to personal property of other to fine art coverage to insurance acquired for a specific item. Safety of artifacts extends from environment to culture and the work place. Workplace safety extends well beyond having carts, hand trucks, and pallet jacks; beyond aprons, gloves, and respirators. Workplace safety includes that each and every member of the staff feels safety in their person. Managers are reminded to encourage performance. When performance is flagging, managers and co-workers focus on making it clear the issue is in the work, being careful to make the employee feel valued as a person. Recently we invited an attorney to present on sexual harassment and hostile work places. Mike Torchia brought a presentation he has give “perhaps 100 times”, including to the Pennsylvania state legislature. He helped us understand how context matters; how the same words or actions change when between co-workers to when they’re between a supervisor and an employee; informed us of the law; worked with us to develop processes for reporting, and evaluating claims, being fair to all parties. Our staff was engaged with questions, attentive during the presentation, and have continued to discuss the topic – keeping it alive and deepening its importance in our company culture. I provide the resources, I set the tone. It’s incumbent on me to lead from the top. At the end of the day, however, it is the 30 people who interact with each other as they interact with our audiovisual heritage that determine the safety of those media. I applaud them loudly.